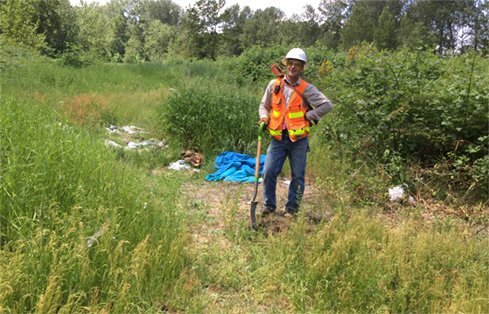 The Pierce County Surface Water Management Division contracted with GeoEngineers to analyze the Puyallup River and determine the effectiveness of a gravel removal program to improve conveyance and reduce flooding. GeoEngineers evaluated river sites and identified two areas offering the greatest potential for reducing the risk of damage to flood control structures and increasing channel capacity. A reach of the Puyallup River, showing the close proximity to a residential community. 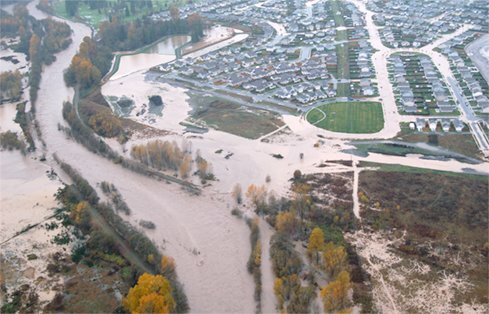 The same reach of the Puyallup river as left, but shown during a flood event. 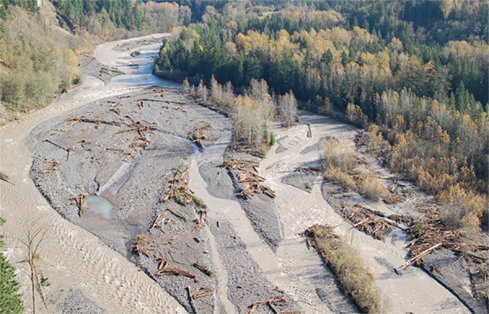 Ecological improvements and gravel removal increase salmon habitat and reduce flooding along the Puyallup River. Like many river systems running through developed land, the Puyallup River in Pierce County, Washington, sometimes floods. When it does, the water can impact public infrastructure, private property and engineered flood control structures. The Pierce County Surface Water Management Division contracted with GeoEngineers to analyze the river system and determine the effectiveness and specifics of a gravel removal program to improve conveyance and reduce flooding. During the initial field reconnaissance phase, GeoEngineers provided fluvial geomorphic assessment, hydrologic and hydraulic modeling, fish habitat analysis and channel response analysis to help identify potential sites for gravel removal. The complexity of this phased-approach project required extensive input and coordination with a variety of stakeholders within and outside of the Pierce County Public Works and Utilities and Surface Water Management Division. Once a gravel removal approach was identified and appropriate sites selected, Phase 2 of the project transitioned into a river restoration effort which included habitat restoration designs, habitat modeling, and development of a restoration effectiveness monitoring plan. GeoEngineers started by conducting a preliminary analysis of the hydraulic, geomorphic, and biologic conditions to help solidify potential sites for gravel removal, define the project’s purpose and present the proposed project to the U.S. Army Corps of Engineers. We evaluated alternative sites and identified two areas offering the greatest potential for reducing the risk of damage to flood control structures and increasing channel capacity. Creating a new secondary channel. Modifying and lengthening another existing secondary channel to more regularly engage it at low flow levels. Incorporating large woody material (LWM) to enhance river processes and habitat. 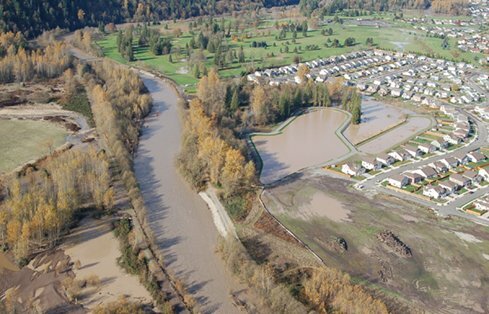 The Puyallup River Basin project is an ongoing effort, with recent designs that include expanded secondary channels and added LWM structures at two lateral sand and gravel bars. The habitat improvements, including addition of wood, boulder ballast, and pools, will provide an overall increase in channel diversity, geomorphic complexity, and salmon habitat availability, while also reducing localized flooding.